We offer group rates with restrictions. Please call our office for details at 301-865-9203. 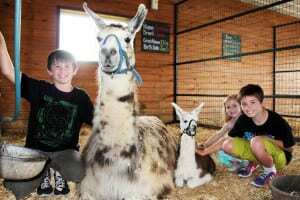 At Green Meadows Petting Farm, every Wednesday that we are open is “Grandparents Day”. This means that ONE Grandparent is FREE with each paid general admission. Preserving special memories … that’s what being a Grandparent is all about! At Green Meadows Petting Farm, memories of growing up on the family farm will come to life again. You will have the opportunity to share your memories while creating new ones that your grandchild will carry for a lifetime. This offer cannot be combined with other offers , promotions or specials. Moms are FREE on Mother’s Day at Green Meadows Petting Farm with a paid general admission! Cuddle the baby kid goats, baby lambs, baby calves, baby chicks, baby ducklings, baby bunnies, baby, baby, do we have babies! How could we not celebrate all Moms on Mother’s Day? Don’t give Dad another tie for Father’s Day. Bring him to Green Meadows Petting Farm for the day. Why? Because Dads are FREE on Father’s Day with a paid general admission. Is Dad brave enough to milk a cow? Can he catch a chicken? Dare him to kiss a pig! It’ll be the most memorable Father’s Day ever. Dad will enjoy reminiscing about his boyhood days of being on the farm.